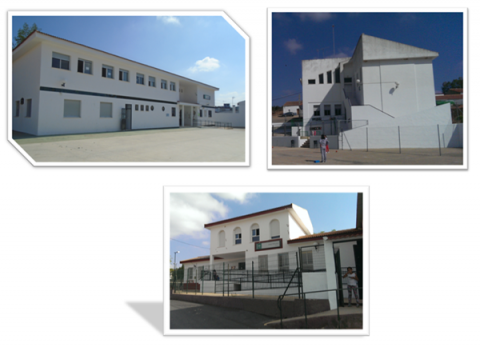 Our school is located in the South West of Spain, in Andalusia and very close to Portugal. It is placed in a rural area and socioeconomically depressed mainly due to the closure of mines in this area. The school is divided into three small villages (Montes de San Benito, Villanueva de las Cruces and Cabezas Rubias) with 90 pupils between 3 and 14 years. There are also 18 teachers who have to travel to one village to another and prevent students from moving. On the other hand, the main difficulty is that the groups are formed by different levels at the same time as we have only a few students of the same level. Our school is very conscious of the environment, as the main activity in this area is agriculture and livestock. We are Echo-school from more than 12 years and we have been awarded with the European Green Flag. Our activities are focused mainly on environment, recycling and responsible consumption, among many others. Our students study English already in preschool. We have been working as a CLIL school for two years, so the teaching and learning of a foreign language is very important for us.